This paper helps to understand the efficacy of BakerCorp Electrocoagulation (EC) technology and treatment process in treating selenium-contaminated mine effluent. 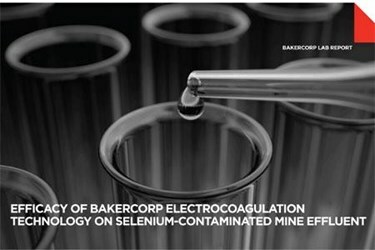 Two mine effluent samples were treated by Baker EC. Selenium constituent concentrations in both water samples were reduced significantly to below reporting qualification limits. Based on the results of the effluent samples, electrocoagulation is an effective treatment option for waste streams found to contain selenium.